Traditionally, the groom sees the bride as she makes her way down the aisle. However, some couples prefer a more private or tender moment before the wedding ceremony begins. That is exactly what the Davenport’s decided to do prior to their ceremony. The White Room in Saint Augustine has a number of quaint, back-alley side streets that make the perfect setting for a first look. This 4 minute video is called my “Pre-Wedding Storytelling Sequence”. I started shooting about 2 hours before the ceremony to get a few shots during the last stages of make-up before the first look happened. 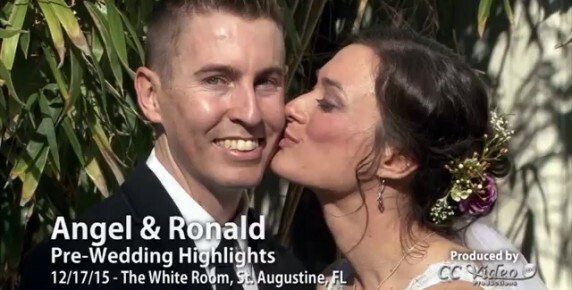 During the editing process of the pre-wedding video, I spend several hours watching and re-watching all the clips as well as listening to all of the small soundbites from family and friends. Then I set it to music selected by the couple. What you end up with is an emotionally charged, highly personalized video where the lyrics are telling a story, their family is telling a story which underscores the beautiful video images taken during the limited time available.